The scripts explained in this guide allow you to automate several Windows Server Update Services (WSUS) tasks such as synchronization, approvals, cleanups, and scheduled update installations. Note: Partially these scripts are not our own, we will provide link to the original sources where we have taken from. This article assume you are familiar with WSUS administration. 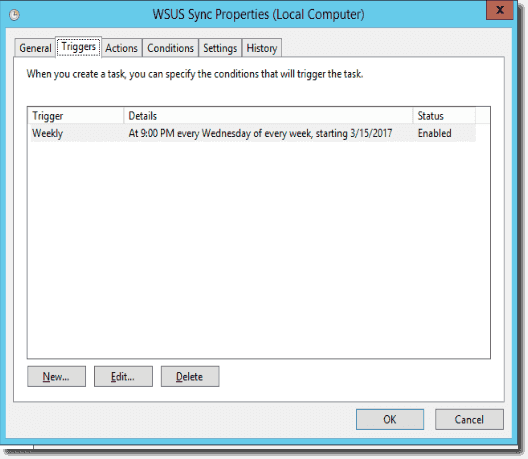 Right after installing WSUS, you have to configure periodic synchronization. Unfortunately, as you can see in the screenshot below, the synchronization options are somewhat limited. 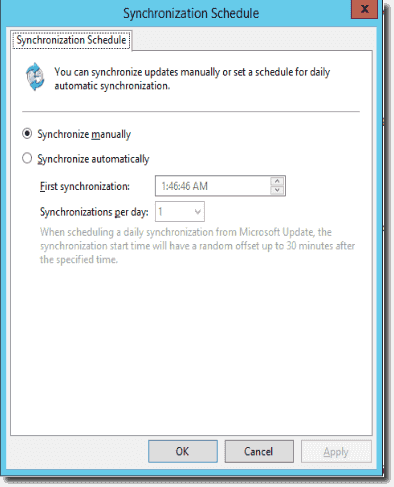 Since we don't need to sync every day, we select Synchronize manually and use the script below along with Task Scheduler to synchronize WSUS at the times we prefer. Load the .NET Update Services object into the $wsusserver variable and use the StartSynchronization() method to start manual synchronization. The screenshot below shows the Task Scheduler task we are using to launch the PowerShell script. Send-MailMessage -From "WSUS@contoso.com" -To $recipients -Subject "New updates have been approved" -Body "Please find the list of approved updates enclosed" -Attachments $log -SmtpServer "smtp-server" -DeliveryNotificationOption OnFailure #Sending the log file by email. $wsus: is the WSUS object. 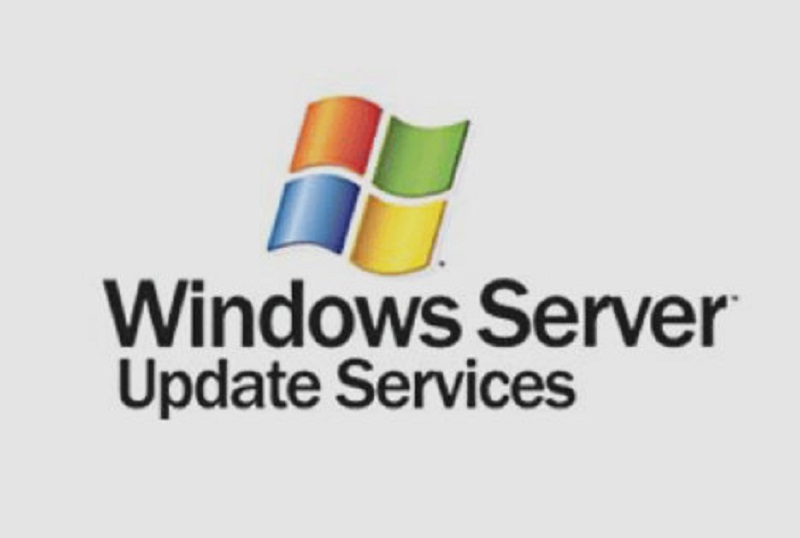 $UpdateScope: Defines the time interval for the $wsus.GetUpdates() method. $groups: Defines all WSUS groups I'd like to approve updates for. $Classification: Defines updates classifications for the $wsus.GetUpdates() method. I'm filtering out service packs, drivers, and upgrades. $Categories: Defines updates categories or products for the $wsus.GetUpdates() method. I'm filtering out SQL and Skype updates. SQL gets updated manually, and I don't have Skype installations in my environment. Then I'm setting up the Update Scope interval to get only updates created within the last month. I know I'm approving my updates every month, so I only need to get recently released updates. After that, I'm assigning the $Classification and $Categories variables to the corresponding objects. And with the help of the $wsus.GetUpdates($UpdateScope) method, I am saving all updates that match my scope to the $updates variable. Then I'm adding some filtering to remove updates such as LanguagePack, FeatureOnDemand, and Itanium from the results because I don't have these kinds of updates in my environment. Now I have all updates I want to approve. 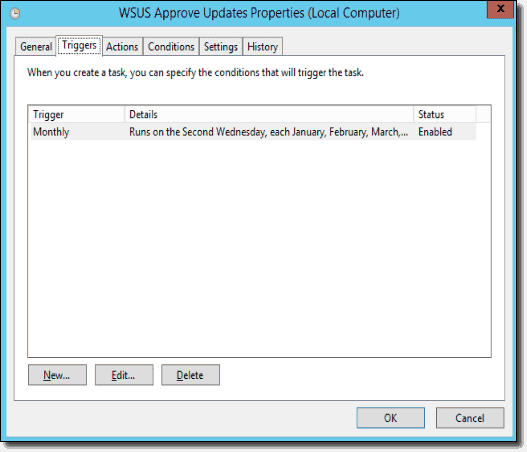 Next, I'm looping through the WSUS groups to which I want to assign the updates. Then I loop through the updates, approving every update for every group. In this particular case, there is only one group. However, I use a loop here, just to be able to add more groups later. After approving all updates, I only need to update the log file and send this file by email to myself. This way, I am sure I've approved the updates, and I receive brief information about them. As you know, Microsoft frequently replaces single updates with packages of multiple updates. They call the replaced update a "superseded update," which is no longer needed. Thus, it makes sense to decline those updates. For this purpose, I modified the PowerShell script below, which I found here. My changes are in the lines 57–59, 99–100, and 242. I added the transcript file, so when the script ran via the Task Scheduler, I could see the number of declined updates. And after I ran the script the first time, I changed the update scope. So it'll check and decline only updates within the last six months. 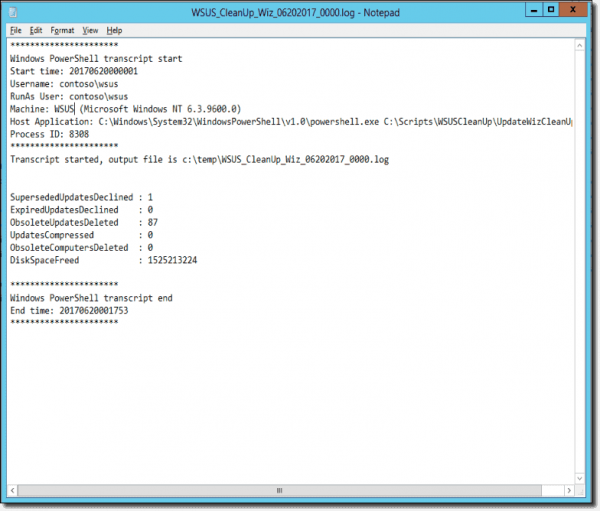 # Script to decline superseeded updates in WSUS. # It's recommended to run the script with the -SkipDecline switch to see how many superseded updates are in WSUS and to TAKE A BACKUP OF THE SUSDB before declining the updates. # Supersedence chain could have multiple updates. # For example, Update1 supersedes Update2. Update2 supersedes Update3. In this scenario, the Last Level in the supersedence chain is Update3. Write-Output "Using SkipDecline and DeclineLastLevelOnly switches together is not allowed." $outSupersededList = Join-Path $outPath "SupersededUpdates.csv"
$outSupersededListBackup = Join-Path $outPath "SupersededUpdatesBackup.csv"
Write-Output "Please make sure that WSUS Admin Console is installed on this machine"
Write-Output "Failed to get updates." Write-Output "If this operation timed out, please decline the superseded updates from the WSUS Console manually." Write-Output "List of superseded updates: $outSupersededList"
Write-Output "All Updates = $countAllUpdates"
Write-Output "Any except Declined = $AnyExceptDeclined"
Write-Output "All Superseded Updates = $countSupersededAll"
Write-Output " Superseded Updates (Intermediate) = $SuperseededAllOutput"
Write-Output " Superseded Updates (Last Level) = $countSupersededLastLevel"
Write-Output " Superseded Updates (Older than $ExclusionPeriod days) = $countSupersededExclusionPeriod"
Write-Output " Superseded Updates (Last Level Older than $ExclusionPeriod days) = $countSupersededLastLevelExclusionPeriod"
Write-Output "SkipDecline flag is set to $SkipDecline. Continuing with declining updates"
Write-Output " DeclineLastLevel is set to True. Only declining last level superseded updates." Write-Progress -Activity "Declining Updates" -Status "Declining update #$i/$countSupersededLastLevelExclusionPeriod - $($update.Id.UpdateId.Guid)" -PercentComplete $percentComplete -CurrentOperation "$($percentComplete)% complete"
Write-Output " DeclineLastLevel is set to False. Declining all superseded updates." Write-Progress -Activity "Declining Updates" -Status "Declining update #$i/$countSupersededAll - $($update.Id.UpdateId.Guid)" -PercentComplete $percentComplete -CurrentOperation "$($percentComplete)% complete"
Write-Output " Declined $updatesDeclined updates." Write-Output " Backed up list of superseded updates to $outSupersededListBackup"
Write-Output "SkipDecline flag is set to $SkipDecline. Skipped declining updates"
All I'm doing in the script above is defining a cleanup scope using the CleanUpScope object and then running CleanUpManager using the corresponding object against that scope. I'm not compressing updates because this operation takes a long time and doesn't save much space. Because all of these procedures are making many changes in the WSUS database, it is good idea to re-index the database occasionally. To do that, I'm using this SQL query from the Microsoft Script Center. You can use the sqlcmd utility you find there to run the SQL query. Just create a scheduled task and run it once a month. 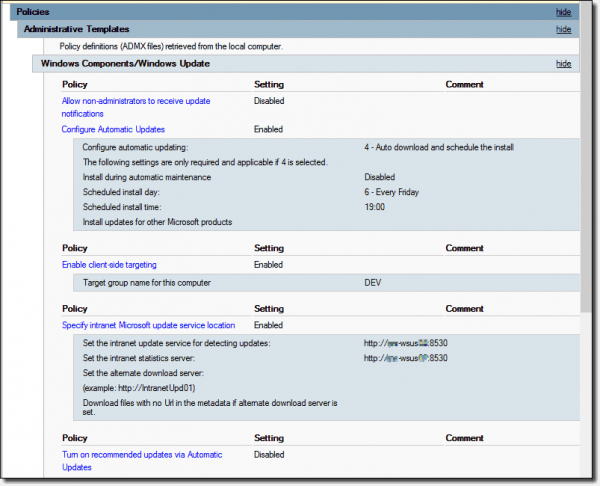 Decline superseded updates after every WSUS synchronization. 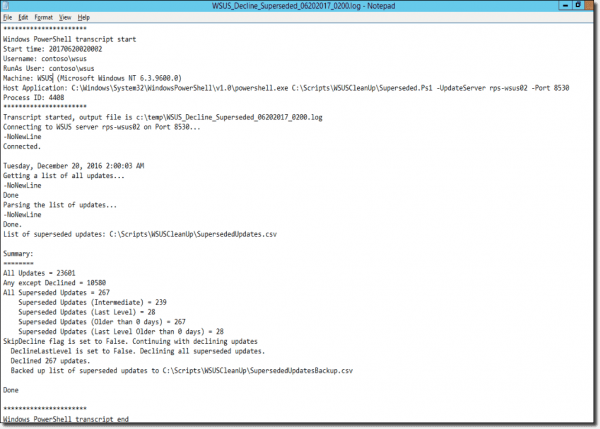 Run the WSUS cleanup wizard script after declining superseded updates finishes. Re-index the WSUS database after WSUS cleanup. Approve updates every Wednesday. This way I know I'm approving updates after removal of all superseded, outdated, and expired updates. At this point I'm done with maintenance. However, I still need to install the updates. Unfortunately, WSUS also only offers poor choices when it comes to scheduling update installations. Basically, I can only pick the day of the week and the time. Of course, this is not always what you want. Because I have several environments, I created a Group Policy Object (GPO) for each of them and assigned them to the appropriate Active Directory organizational units (OUs). As you can see, I configured this GPO to install updates every Friday at 7 p.m. The thing is, I just need to do this on a particular Friday every month. Thus, I wrote a tiny script for enabling this GPO and a second one for disabling it. Then I configured a scheduled task to run the first script a couple days before the update day and the second one after installing the updates. $GPO = Get-GPO -Name "WSUS DEV OU - Automatic Updates"
After automation configuration using PowerShell scripts, you are advised to keep eyes on WSUS server every once in a while to make sure everything perfect as intended.